Self propelled, up to 20mph on road, 60 metres per hour in field mode. Selectable two-wheeled drive, and two and four-wheeled steer. Up to 9 metres long and up to 6 metres wide. Any type of harvesting unit can be fitted to the front. A wide range of layouts are available, depending on the product and the type of packaging. Built with heavy duty steel or plastic chains. The harvesting arm is standard at 6 metres long from the tractor centre line to take in a 12 metre bed system. it is hydraulically folded for road mode, and the chain is hydraulically driven with variable speed. Range between 8 and 16 pallet capacity. Single or tandem axle with or without suspension. Body 9 metres long, which turns through 90 degrees from road to field mode. Folding walkway and box rack, extendable to work within a 12metre tramline system. Flat bed with tipping capability to facilitate placing in bulk bins. Trailers incorporate hand held floretting units for brassicas and cauliflowers used by the freezing industry. Removes the driver from the cab. Through simple to use electronic buttons it is possible to stop and start the tractor, control speed and steer left and right. 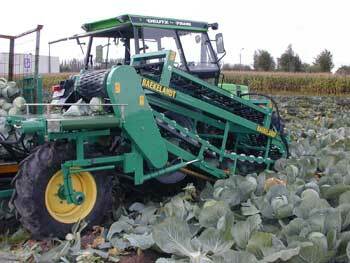 The Mangnus Cabbage Harvester has been specially designed to harvest cabbages without damage. The feed mechanism gently picks up and guides the cabbages through the machine and the depth adjustment and special drive mechanism allows the cabbages to be precisely cut. VHS are the sole agents in the UK for the Deman Harvester. It can be used as a tractor based wrap round, self propelled or trailed. Can be 2, 3 or 4 row machines complete with 6 knife heads.